Ever heard of the Battle of Chickamagua? It is the most significant Union defeat in the Western Theater of the American Civil War, the battle resulted in the second-highest number of casualties after the Battle of Gettysburg. And it was on this battle that Jacob Miller was shot in the head on 19 September 1863. Everyone in his unit assumed he was dead, but the Union soldier ended up living for another 54 years. His survival was nothing short of miraculous. Why's that? Because he had a giant bullet hole in his forehead. Left for dead on the battle field, Miller regained consciousness hours later. His firsthand account of the battle was published by The Joliet Daily News in 1911. "When I came to my senses some time after I found I was in the rear of the confederate line. So not to become a prisoner I made up my mind to make an effort to get around their line and back on my own side. I got up with the help of my gun as a staff, then went back some distance, then started parallel with the line of battle. I suppose I was so covered with blood that those that I met, did not notice that I was a Yank, (at least our Major, my former captain did not recognize me when I met him after passing to our own side)." The wound never really healed, but it's pretty safe to assume it saved his life. What happened next? "I suffered for nine months then I got a furlough home to Logansport and got Drs. Fitch and Colman to operate on my wound. They took out the musket ball. After the operation a few days, I returned to the hospital at Madison and stayed there till the expiration of my enlistment, Sept. 17, 1864. Seventeen years after I was wounded a buck shot dropped out of my wound and thirty one years after two pieces of lead came out." 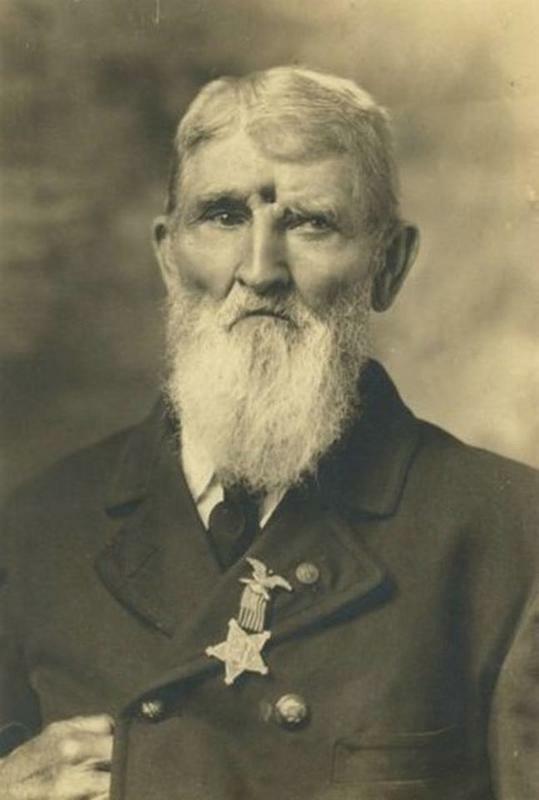 Miller walked around with a bullet in his forehead for 31 years. Was he bitter? Hardly. "Some ask how it is I can describe so minutely my getting wounded and getting off the battle field after so many years. My answer is I have an everyday reminder of it in my wound and constant pain in the head, never free of it while not asleep. The whole scene is imprinted on my brain as with a steel engraving. I haven’t written this to complain of any one being in fault for my misfortune and suffering all these years, the government is good to me and gives me $40.00 per month pension." Notice the Medal of Honor he's wearing? It has nothing to do with the hole in his head. Miller was awarded the medal in recognition of his gallantry in the charge of a "volunteer storming party" on 22 May 1863. Pretty inspiring and badass.